You don’t fully appreciate your feet or your ankles until you can’t use them anymore – that’s why seemingly benign motorcycle accidents can be brutal if there’s damage to the feet or ankles. 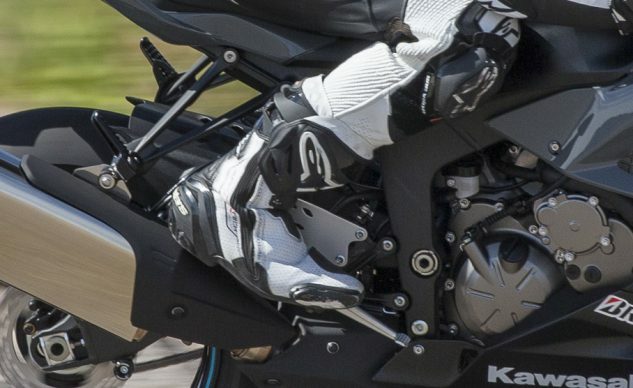 It used to be (and sometimes still is) the norm to simply wear leather work boots or military-style boots on a motorcycle, but if you’re piloting technologically advanced vehicles like sportbikes, you should have equally advanced boots to match. Especially if you’re going to the racetrack. Here, we’ve gathered some of the best race boots currently available on the market. Though they all perform the same basic function, each brand has its own specific methodologies. Alpinestars started as a boot company, making hiking shoes for folks to climb the Italian alps. Since then, premium footwear has been at the heart of the company. 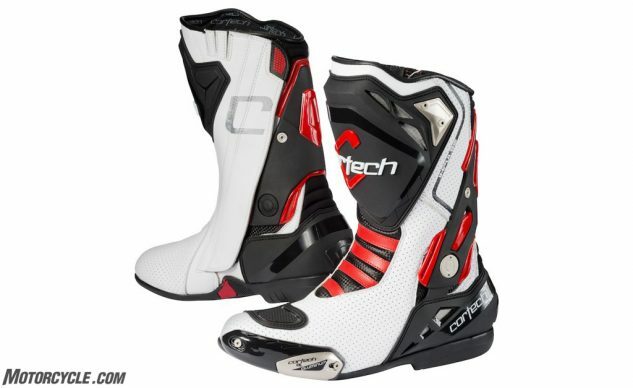 The Supertech R boot is the pinnacle in Alpinestars’ track footwear lineup. 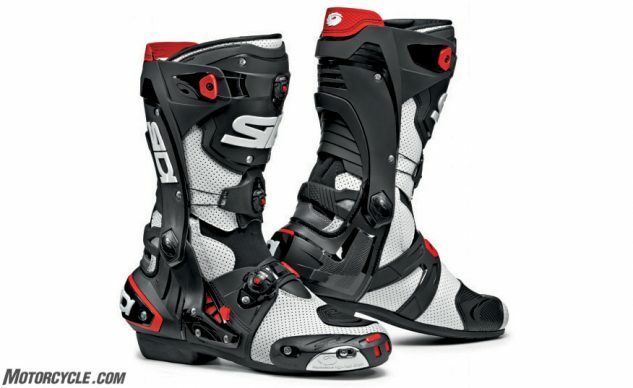 The secret sauce for the Supertech boot is the internal bootie, aka the Biomechanical Ankle Brace. To sum it up in a few words, two fiberglass reinforced polyamide braces act as hinges on each side, allowing the ankle to only move in its natural direction (up and down) and preventing movement side-to-side. It works in conjunction with the outer boot (the part visible to the outside world) to provide ultimate impact, abrasion, and rotational protection, while still being thin enough to give the rider maximum feel of the motorcycle’s controls. The least expensive boot on this list, the Impulse Air by Cortech delivers some premium features for a price that won’t break the bank. You can see in the photo a triangulated carbon fiber bracing structure that covers both ankles. This helps keep the ankle from moving in an unwanted fashion, while a TPU injected heel guard is big and beefy to keep the Achilles safe. Inside, an integrated inner lacing system (not quite a separate internal boot) keeps the Impulse close to your feet. A low-profile toe box keeps your toes close to the levers, while an aluminum toe slider protects against the pavement (and it’s replaceable, too). You’d expect a boot with Air in its name will breathe well, and the Impulse Air incorporates vented Mycro Tech in the upper, as well as a breathable mesh inside to keep plenty of air moving. 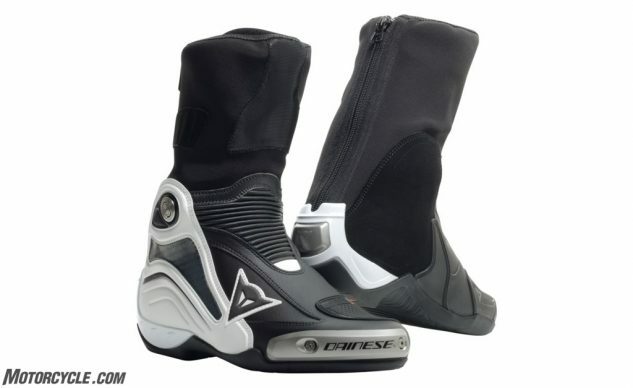 The Dainese Axial D1 boot is unique among race boots because it is the only boot where the upper portion is placed inside your leathers (Dainese leathers specifically, though custom suit makers can build their suits to accommodate). The result is a lightweight boot that still provides the same level of protection as anything else out there. Dainese’s D-Axial system is an articulated structure built into the boot that helps protect against twisting of the ankle. It also serves to distribute impact energy across the entire boot, and it’s the last line of defense in case a foreign object were to penetrate the outer surface of the boot – which in itself will be highly unlikely to happen considering the D-Stone fabric is a heavily reinforced nylon. 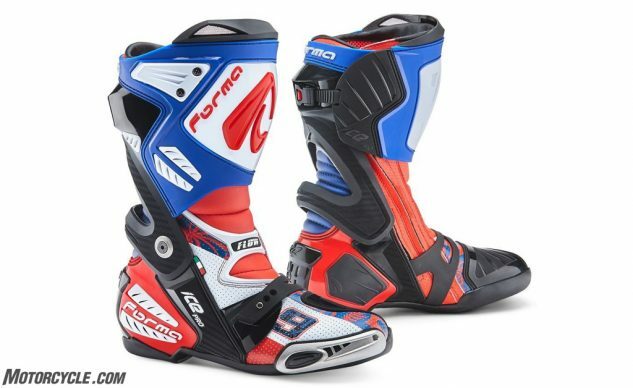 While not a widely known name in track footwear, Forma racing boots are worn by top-level racers all over the world, including in MotoGP (as the Danilo Petrucci replica graphic above gives evidence to). The Ice Pro Flow provides cool airflow to the rider via a ventilated microfiber upper combined with a ventilated stainless steel toe slider. You can see the aggressive anti-torsion bracing across the achilles that hinges at the ankle to keep the foot from rotating in a way it isn’t supposed to. Injection molded protection across the heel and over the shins add a layer of shielding from impact, and a replaceable slider at the top of the boot is included in case you’re the type whose riding style takes advantage of such things. Other features include a YKK zip closure, ratcheting calf adjuster, race compound sole, air-mesh lining, and polymer memory foam for an extra layer of cushioning. 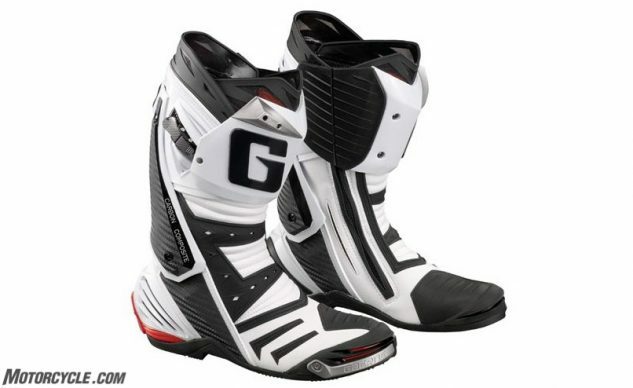 Gaerne might be better known in off-road circles, but its GP-1 road racing boot is quite the performer. It’s highlighted by the carbon composite Gaerne Floating System, which consists of a brace, using two points at the ankle as the fulcrum, that limits the ankle from twisting and flexing too far, helping to prevent hyperextension or compression. At the heel, the polyurethane heel cup is rigid enough not to deform in a crash, and the magnesium cover promotes sliding in a fall. If you look at the image above, you’ll see a slither of material in red at the heel. These are inserts in both boots to help distribute shock away from the heel. Entry and egress are achieved with zippers, and a ratcheting buckle helps tighten the boot to the calf. Here you can also see the heavy-duty shin plate, which is also replaceable. Constructed from Lorica, the inner portion of the boot features rubber inserts for more grip against the motorcycle. Inside the boot, the sole is fully removable and washable, while the lining is antibacterial and breathable. 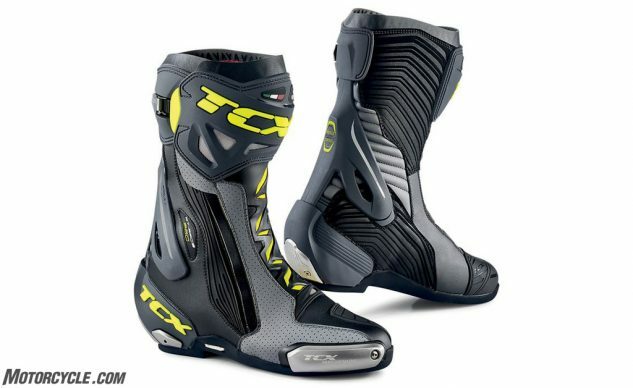 Sidi is one of the most established names in motorcycle footwear, and the Rex Air is the company’s latest racing boot offering. You can see the base material is heavily perforated for maximum airflow. The material itself is a synthetic microfiber material that’s lighter and stronger than natural leather while also having high abrasion resistance qualities. After opening the zips and placing your foot inside, you dial-in the fit using Sidi’s proprietary Tecno-3 system, wherein half of the circular buckle rotates 90-degrees, creating a handle. Turning the dial clockwise pulls steel cables, tightening the boot to your foot. Like other boots here, you can clearly see the ankle support bracing spanning the height of the boot. Further ventilation zones at the bottom of the brace and at the toe slider bring in lots of air. Spidi’s footwear division, better known as XPD, brings us this offering from the racing lineup, the XP7-R. On the exterior, you can see the Lorica outer provides similar abrasion resistance to leather. Usual features like a heel guard and replaceable toe sliders are also visible. Moving up the boot, a velcro strap at the mid boot helps fine-tune calf adjustment, but the primary opening is through a zipper entryway on the side (reinforced with velcro) you can’t see here. The double opening makes the boot very easy to fold over so you can get your leathers placed correctly within the boot. 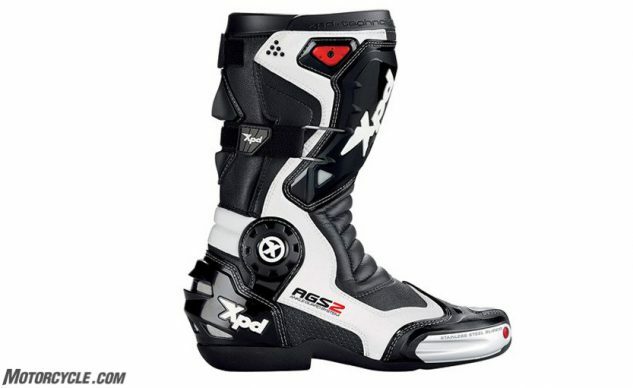 However, the major talking point with the XP7-R is the AGS2, or Ankle Guard System found inside the boot. Basically, an inner boot structure using the circular hinge at the ankle as its fulcrum, the structure secures itself to your leg with velcro, allowing the ankle only to move forward or backward along a single plane. 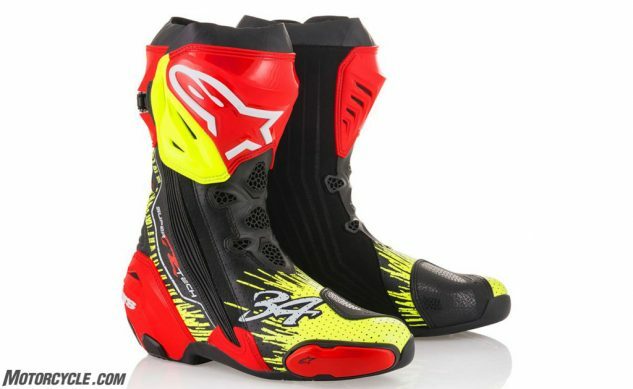 The XP7-R is also CE certified (as are most of the boots listed here). The TCX RT-Race Pro Air is the Italian company’s premium offering in the racing segment, constructed from a microfiber base featuring TCX’s Double Flex Control System, which uses the large blade-like support brace at the rear of the boot to essentially control forward or backward movement of the ankle. Taking the boot on or off is through the zippered opening found on the outer edge of the boot, with a ratcheting calf closure at the top, finished off with the F.F.C., or Fasten Fit Control lacing system. On the inner side of the boot you’ll find a large swath of abrasion resistant microfiber to provide maximum feel of the motorcycle. Speaking of which, the RT-Race Pro’s sole features a double compound rubber designed in conjunction with Michelin inspired by the Power Supersport Evo tire. Other features include magnesium toe sliders and heel plate (check with your racing org if these are legal).